Trap Tales is your guide to avoiding the seven obstacles that ensnare people every day. We all fall into traps, and we often don't even realize it until we're deeply entrenched. Like quicksand, traps are easy to step into, but difficult to escape--it seems that the harder we try to climb out, the deeper we sink. But what if there were another way? What if we knew the right strategies to escape the traps we have fallen into? What if we could spot traps from a distance, and avoid them entirely? In this book, authors David M. R. Covey and Stephan M. Mardyks train you in the art of Trapology. You'll meet Alex and Victoria, who have fallen into traps you're sure to recognize. As you read their stories, you'll learn about the seven most common traps in life and work, and how even the smartest and seemingly most accomplished people find themselves stuck and unable to see their way out. Traps are masters of disguise, but there are telltale signs that give them away every time. 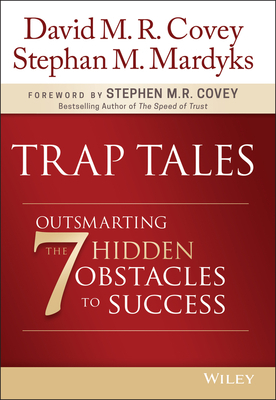 If you discover that you're trapped right now, consider this book your lifeline--the lessons contained in Trap Tales will teach you how to escape these traps and how to sidestep them in the future. The core message of Trap Tales is hope--the belief that anybody can change the trajectory of their life, at any stage of their life. Stop letting traps steal your time, money, energy, and happiness--Trap Tales provides survival training of a different sort, allowing you to write your own tale of success.